This newspaper clipping shows suspended City College registrar John K. Ackley sitting at his trial before the Board of Higher Education. Ackley had been identified for his Communist ties by the Rapp-Coudert Committee in April 1941. By June, he was the first City College employee to be tried and fired as a result of the committee's hearings. His firing marked the first of dozens for the college's faculty and staff that came at the hands of the Rapp-Coudert Committee. The state appointed group, seeking to investigate subversive influences in New York City's public schools and colleges, held private and public hearings with more than 500 faculty, staff, and students between 1940 and 1942. Shortly after his initial suspension in April, Ackley spoke before a group of Columbia students at their invitation and declared the Rapp-Coudert Committee hearings "a conspiracy against the schools, and part of a broader conspiracy against academic freedom and trade unionism." In April 1957, Ackley, later employed for the Metropolitan Music School, would be called to testify before a sub-committee of the House Committee for Un-American Activities, again for his ties to the Communist party. 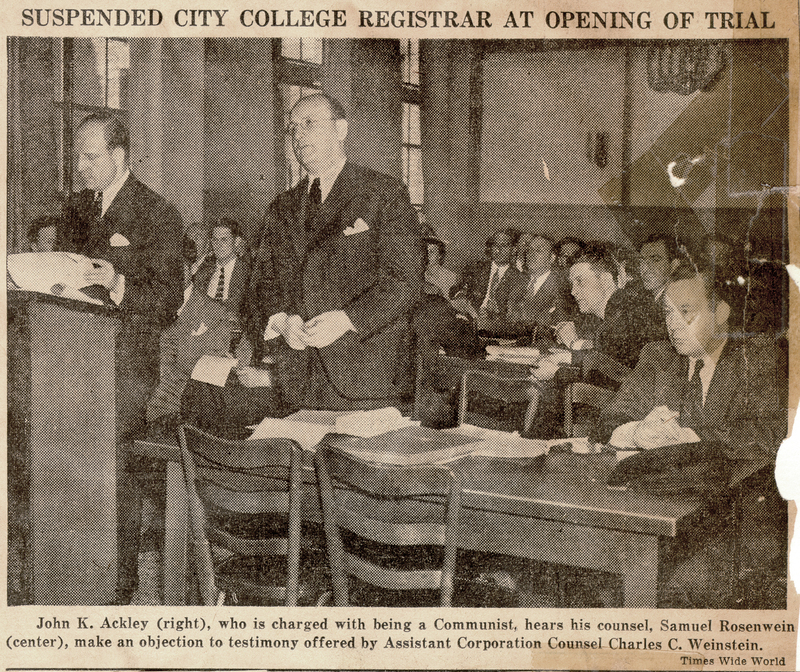 Cite This document | Times Wide World, “"Suspended City College Registrar at Opening of Trial",” CUNY Digital History Archive, accessed April 20, 2019, http://cdha.cuny.edu/items/show/3852.